Is RIM planning a tablet with an 8.9 inch screen? Come on, everybody's doing it. What harm could happen? The topic here is tablets and it could be that another major manufacturer is coming to the table with a tablet of its own. A research firm that checks supply chains for signs of unusual orders has supposedly discovered and confirmed from 3 sources, that RIM has been ordering an 8.9 inch tablet from the Hon Hai Precision division of contract manufacturer Foxconn. The product would be ready to ship in the summer or fall of this year and is the subject of a report "RIMM (they used the stock symbol) Launch Own Tablet in Late 2010". Many, many questions are unanswered such as the OS of the tablet. Would it use the 'Berry OS? Would it use 6.0? According to those "in the know", the device would feature advertiser supported content and would sync with a BlackBerry smartphone using 3G or Wi-Fi. 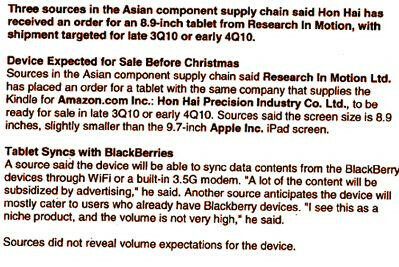 Before you BlackBerry fanatics get too excited, there might not be too much reality in that report. After all, RIM Co-CEO Mike Lazaridis recently told Walt Mossberg that, ""I don't see the benefits of a tablet over a notebook... A lot of technology falls in the middle." Then again,wasn't it the top brass at RIM that poo-pooed the idea of touchscreen handsets when the iPhone was introduced? Maybe Please Oh Please RIM Tablet with a SurePress Screen!!!!..... LMFAO!!! Then it could have the amazing web browsing experience that all blackberries have..
Oh for the love of all that is holy, NOOOOOOOOOOO!!!! I own a BB 9700, I love my phone, it does everything I want to. RIM has had enough bad press with the Storm and seemingly spreading themselves too thin to worry about another project like this. Touchscreen + BB OS = bad times... and a big reason I hate touchscreens. Please RIM, don't sell your sould for another Flavor Of The Month fanboy toy! Resist the evil!!! Dear RIM Executives, YOUR NOT A TABLET COMPUTER COMPANY! YOUR NOT EVEN A COMPUTER COMPANY! Please knock it off with this copycat bullsh*t because more likely than not you will fail, as we've previously experienced (myself with the Storm 9530). Stick to what your good at, which you obviously need a refresher course...Corporate and consumer email solutions and PHONES! Thank you Sincerly, a soon to be Android customer if you dont cut the sh*t! LOL, im sorry, it's Friday, i'm bored and trolling. If this launches soon, it won't sell well. Why? Because the ipad. Everyone wants an ipad Zune and Microsoft launched the zune HD a while ago, but the itouch still sells more because it's made by apple. Apple dominates a Lot of the entertainment industries. And iPhone os 4.0 is coming also.